If you think that you don’t need a blog or believe that blogging is only for large international companies with certain target markets, then, as Darryl Britton from WiserWeb advises, you may need to re-adjust your thinking. Research reported by the Huffington Post consistently shows how important blogging is for building business – with companies who invest in this medium receiving 67% more leads than those who do not. Beyond this however, blogging delivers a wealth of benefits for businesses of any size, and there are many reasons that should motivate you to begin a blog and to do it well. it is estimated that by 2020 customers will manage 85% of their relationships with a company without human contact. This makes the image you portray through your website and social media presences absolutely vital – integral to which is a company’s blog. – Businesses that blog receive 97% more links than those who don’t. And for those who don’t know, links into a website have an important impact upon search engine positioning. Consumers and businesses are savvier than ever before when it comes to researching products and services – and consider blogs to be an essential source of information as to whether the company before them is one to be trusted. Blogging can help nurture a relationship between a reader, and your company; and making a personal connection with a potential customer is often of far more value than making a singular sale. Before you jot down so much as a word, you need to take time to consider your target audience. What do they want to hear about? What will be useful to them? What do they care about? In this instance buyer personas are incredibly useful, and can help you truly visualise who your various target market segments are. A good website development company will be able to provide you with a a useful template and introduction to help you with this task. The next stage is to brain storm a few topics and working titles. This can help you in getting to grips with direction and make the entire process of actually writing all the easier. Your introduction needs to captivate and inform in equal measure. In 150 words or less you need to let the reader know what the blog is about, and most importantly why it matters to them. You can grab attention by retelling a story, sharing a humorous joke, being empathetic to a problem they may have or interesting them with a statistic. 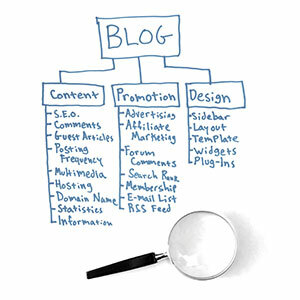 Whilst you may be tempted to write your blog post all in one go, don’t. Consider how you can break down what you wish to cover into manageable chunks of text (which will be sectioned off with compelling headlines). Using the template that you’ve created you’re now ready to take pen to paper. Begin with your own knowledge and pad out your content with research where necessary (including statistics and facts that can also help to backup all that you’re saying). If you stumble across writers’ block then you may want to take a little time out to discover other blog posts on similar topics – but obviously, don’t copy them – just take inspiration from them! Last but not least… don’t forget to proof read! Never, ever neglect the proofing stage. You should also complete the post and ideally leave it until the next day so that you have a fresh pair of eyes for reading over the content. Finally, you should hand over your work to another person, or persons, so that they may feedback as to how it can be polished and perfected before being released to the world!